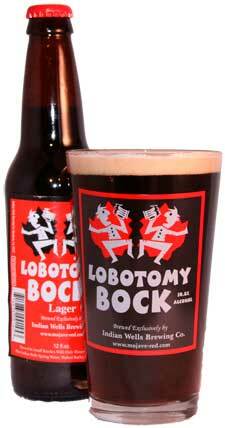 Lobotomy Bock is my favorite beer and I've just learned that it's recently been emasculated! It's brewed by Indian Wells Brewery, a small shop located here near Inyokern. I stop there often to buy some, since the prices are way lower there than at any store. Plus it's on my way home from many of the places I go off-road adventuring. Yesterday I bought a 6-pack of LB at Whole Foods. It didn't taste right. Something was missing. It tasted very weak. I searched the packaging and labeling and could not find the usual 10.8% alcohol content warning. I googled to no avail. So then I emailed the brewer - and surprisingly I got a reply within a few hours. Rick Lovett (President & Founder of Indian Wells Brewing Co.) politely answered me by saying that they have, indeed, lowered the alcohol content in Lobotomy Bock. He said they "lowered it due to a lawsuit." I'm saddened and disappointed. The stuff I bought tastes like 3.2 beer I drank as a kid in Colorado, and which I recenty had in Utah. I don't see how they can honestly still call it a dopplebock. The next time I'm up north, I'll check to see if they still sell the full-strength brew at the brewery. If so, it will remain my favorite beer. UPDATE: see my post on Jan 29 about finding the full strength version at the brewery. Michael, you will be less surprised if you ever tried German beers both in Germany and US. For me it was unpleasant discovery to find that Bavarian Salvator is limited in alcohol (and taste) in US compared to Munich. Big companies level the beer to US requirements. Small companies simply don't care about our market. I find this low simply stupid. Wow! I can't believe this. I have always enjoyed Lobotomy Bock too, and we always enjoy stopping at the brewery when we're on our way through the area. Hopefully they are still selling it there - please do report what you find out. That must explain why this beer tastes so weirdly thin. I swear the six pack carrier had 10.8 on it -- but I don't see it anywhere on the bottle. I would not buy this again, it's got almost no flavor. Have you found anything for certain on the alcohol level of Labotomy? I recently found this beer and drive across state lines into Louisiana just to get it. It's a shame if this is true, but the beer is still great. Justin: Not yet, but I plan to ask them at the brewery when I visit. I hope to do that this Friday or Saturday.